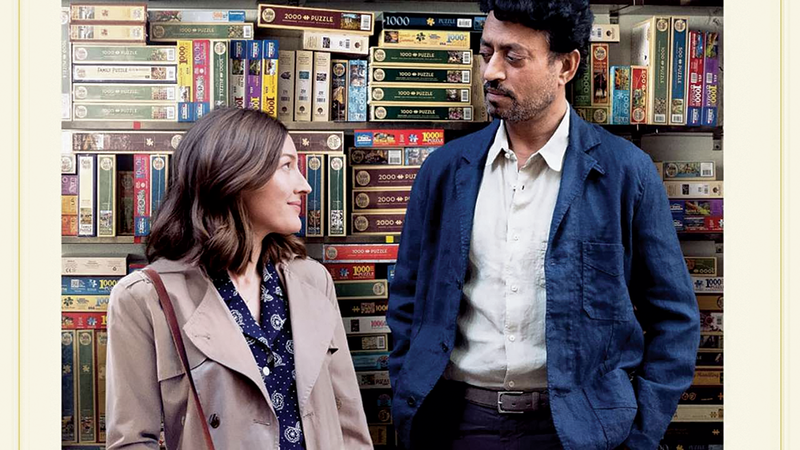 Kelly Macdonald and Irrfan Khan in Puzzle. Back in the 1980s, Michael Caine appeared in a BBC series titled Acting in Film, which focused on the finer points of how working for the camera differs from working on a stage. I've always remembered one of those lessons in particular, in which Caine reveals the way a simple roll of the eyes can convey one character's attitude toward another. The reading of a line might be a consistent thing, but subtlety of expression and gesture are what make a wonderful cinematic performance sing. That sort of subtlety is at the center of what makes Puzzle so much more effective than its familiar plot dynamics. Kelly Macdonald plays Agnes, a Connecticut housewife who devotes herself to caring for her husband Louie (David Denman) and two sons (Bubba Weiler and Austin Abrams), and whom we meet while she's running through the details of preparing for a birthday party—a birthday party that turns out to be for herself. One of her gifts is a 1,000-piece jigsaw puzzle, which she completes with surprising speed. While searching for more puzzles, she finds a posted ad for a man named Robert (Irrfan Khan) searching for a partner for a national puzzle competition, and soon puzzling is the part of her week she looks forward to most. It's hardly a groundbreaking character arc at work in the script by Polly Mann and Oren Moverman, which is itself an English- language remake of Natalia Smirnoff's 2009 Argentinian drama Rompecabezas. Agnes is in many ways a familiar type—like the housewife protagonist of The Bridges of Madison County—who begins to consider new possibilities at a moment in life where she was resigned to sameness. That character is complicated, and not always in a good way, by her Roman Catholicism and her family history as the child of Hungarian immigrants; the script sets the story's time frame explicitly during Lent, making the self-abnegation that defines her feel like an Old World throwback in which her faith is the villain. Yet, the journey Agnes takes is made more fascinating by the way Macdonald plays the earliest scenes. There's no sense that Agnes is discontented in her life at the outset, as she goes through the tasks of her day with a sense of accomplishment. There's a wonderfully telling moment in the beginning as Agnes reacts to Louie's mumbled request for "five more minutes" after the morning alarm goes off; she mouths the anticipated plea along with him, and gives a faint smile; she's not annoyed by Louie's predictability, but finds it comforting that she knows him so well. Macdonald plays those kind of small moments beautifully throughout the film, whether it's her satisfied stretch upon completing that first puzzle, or conveying through her body language the reality of her comment to Robert that "I'm not comfortable, generally." That awkwardness with Robert—an engineer living off the ample income from his one successful invention—gets an added spark from a performance by the great Khan that's just as rich in detail. The scene in which Agnes and Robert meet immediately introduces Robert's obsession with news items about disasters and geopolitical strife, but something that could have been merely a neurotic quirk becomes completely different through Khan's bewildered exhalation. A small twist of the mouth or an unexpected way of delivering simple expository dialogue gives Robert a unique quality that makes him more than simply the exotic guy who could tempt this simple woman. This guy is just as weird and uncomfortable in his skin as Agnes is, which makes their pairing considerably more interesting to watch than just waiting to see whether they'll hook up.